I am looking for spell work advice to help my wife and I find respite care for my son. My son has autism and we receive many services for him including PCA (Personal Care Attendant), educational intervention and behavioral therapies. We have the funding approved for respite care one weekend a month. Respite care is meant to give parents and caretakers a break so they can rest up and run errands and complete household tasks (….and maybe a date) that are difficult with our little guy around. There are two kinds of respite care. One kind is institutional where our boy would be cared for by a staff, the other kind is where the foster care system places him with a foster family that can care for him. The institutional care has over a 20 year waiting list (or so we are told), so we have been trying to find a family that could take him once a month. We have had little luck. We found one family who would be willing to take him, though they regularly also care for troubled kids with sexual abuse issues. With my boy’s vulnerabilities I was not comfortable with that. The other person we found was a special education teacher who worked with Autistic children for a living. We thought we had found our perfect match. The catch was that she cared for another boy the same weekend. We tried a few weekend for the boys to get to know each other but it did not work out. My son is a sensory seeker, and quite frankly a generator  and the other boy shied away from stimulus. We were told that since the other boy was there before that he would stay and my boy had to go. We have had no other leads since. We have continued working with social workers trying to find respite care, but they seem to have forgotten us. We check in with them regularly to ask about the search and they tell us they have not found anything for us. We have started to search outside the “system” for possible caretakers but it is slow going. My question for this forum is: what kind of working(s) would you folks recommend for achieving the goal of finding caring, safe, consistent, and responsible caregivers to provide respite care for my boy. Any ideas and advice would be greatly appreciated. for a solution (kind responsible person) "outside the system"
One last thing, in the mundane world, you might already have done this, but I would start looking for any non profit that assists both with funding and volunteers and also families in similar situations. ***edited to include Peaceful Home:*** and Blessing link. I believe these will really help, too. Take Care T-Mike, you and your family. I agree with Miss Tammie Lee -- a Road Opener is a great start. While working with the road Opener supplies, i would pray for the assistance of a Guardian Angel or Helper Spirit to guide your footsteps to the respite care worker person or to guide and lead the respite care worker to you. And i would go to Vistaprint, where you can get 250 FREE business cards (they are free because they have a Vistaprint ad on the back, which does not matter in this case) and i would imprint those cards with my name, address, and phone number. Dress the cards with Road Opener powder and with Spirit Guide powder (lightly!) as you pray over them, and then set about handing them out to everyone who looks like they might help you or know about someone who might help you. You want a respite care worker who has received ABA training for autism, developmental delays and learning disabilities, and will work with your son, not simply keep him safe while you have a day off. You want a person who has done this before and is competent, not a newbie. You want a person who is dedicated to the task of educating and improving the communication skills of autistic children, not merely warehousing them. You want a person who is alert to and aware of current medical science research on autism and thus is not locked into a "deal with it" modality but is actively researching the subject and will bring new scientific and medical findings to you as a matter of mutual interest and helpfulness. You are looking for a person who believes that no case of autism is "hopeless" and that your son can, at any age, continue to improve his social and communication skills -- and who is ready to devote cheerful and hopeful time to this important task. Thank you very much for your advice. I am working it out with my wife what we are specifically looking for in care for my son and plan on taking your advice to heart. I found the vistaprint website and will be ordering the cards soon. Once again, thanks for the advice and I'll let you know how things turn out. My sister is having a horrible time trying to wean my niece off of her bottles. I have tried various techniques but have never incorporated spellwork into my attempts. I know of some methods for getting people to stop drinking alcohol but am unsure if these spells will work in a child/bottle situation. Any suggestions would be greatly appreciated! I know that this sounds like a trivial situation to ask for help with but it would make a huge difference in the life of my sister and my niece. So... I have been looking into some spells to solve this problem and I came across one that sounds promising but I want to get a second (or third) opinion. The spell involves writing the problem (bottle drinking) on a piece of paper and dipping that paper into essential oil of mint and sandwiching the paper between the two halves of an apple, skewering the halves together and securing with a black ribbon, and then burying the apple. As the apple decays in the dirt, the problem is supposed to banish as well. What do you think? Any suggestions and/or insight would be great! I would like some input on what products and candle colors to use for my son. I realize that this is going to take some mundane work on my part for getting him extra support to catch up (i.e professional tutoring, one on one parent coaching, counseling), however, I would also like to begin a spiritual work regime for healing his emotional and behavioral challenges as well as clearing the way for him to have increased self control, judgement, and insight into his behavior as well as social skills and rules of society and just daily living. After this I would like to work on getting his emotional and social challenges healed so that he may eventually be able to transition back into a mainstream classroom. I would also like to improve his communication skills (sharing his feelings and thoughts). I would appreciate some feedback on what products, candle colors, and prayers to use. You have some great products in that list africanviolet. Baths and laundry loads with the crystals of those will help dress all members of the family toward his recovery. Another good combo is King Solomon's Wisdom and John the Conqueror. Burn purple and yellow candles with the oils. Having him keep a large or an extra-large John the Conqueror root as a pocket piece and teaching him to oil it every morning with a mixture of the oils could give him an active part in the Conjure and a certain sense of empowerment. Alternatively, having a triple strength Mojo hand fixed custom for him by the team at LM could also be helpful. Blessings and support to both you and your son. Thank you so much Aura! In a few weeks, I will definitely look into purchasing the Triple Strength Mojo Hand for him from LM. I purchased the bath salts of the multiple ones you suggested as well as the oils and I happen to have a John the Conquerer Root, and actually added the JCR oil to my order today! Which mojo hand would you exactly recommend? And depending upon which one, should there be any special requests for an added oil or prayer to ensure his needs are collectively met by the Mojo Hand in case its specified towards one objective? Also, any particular bible verses or psalms for his collective work? if you want a custom hand that will take into consideration all of his needs, then it's propably best to call Luck Mojo, explain the need and have them craft a custom hand. In this case, in the ready made hands, a Crown of Success would probably address the most issues at once: http://www.luckymojo.com/mojo-3x-crown-of-success.html. You could then dress it with a combination of John the Conqueror, Crown of Success and King Solomon Wisdom oils. In the psalms, 23 is always a good choice: there is benefit and peace of mind to be had in its daily recitation. Others you may want to consider include 33, 65 & 106. I have a son who is 10 now. He's a good child but when he get into his fits is throws serious tantrums, want to fight and argue back. His father is kind of the same way I don't want him to grow up the way his father turned out. He is in special education cause he started talking late (his father is the same way) and he also have a problem focusing well somethings he just dont care and it's getting worst. He's a twin but my other son is a great kid but it is affecting him too, cause that my child with the problem attacks him as well. I want to break the curse which I think it is after finding out thing from my ex. He and alot of the male children in his family experience this behavior. The one with the problem looks exactly like his dad and my other twin looks like me. I was thinking of doing a honey jar but he is a nice kid and only when when he is lashes out its really bad. Not sure how the vinegar bottle would work in this case. I was also thinking of doing a binding but not sure, as well as a cast off evil spell and protection for the him and my family. Not sure what direction I should take, so anyone's help will be greatly need. I'm open to anything right now cause the past week have been bad. Thank you all in advance. DON'T work a vinegar bottle or binding on a member of the family (particularly a child) that you're trying to help. It will sour his life even further and probably make him more aggressive within even if you end up able to control the effects without. For your situation, which is complex, a multi-facetted approach will no doubt serve all persons involved best. On a mundane level, getting your problem son a full physical check-up and psychiatric evaluation may well help pin-point any issues that need to be dealt with medically. Behavioural therapy might be of benefit as could play therapy or art therapy. A mild sedative herbal tonic may also be helpful if indicated by your health professionnal. For the crossing or curse (and perhaps you want to have that confirmed by an ethical root-worker like the folks at AIRR by getting a short reading) a course of 13 herb bath done on the child or on a doll-baby of him may help. A Cast Off Evil spell kit as you suggested is a great follow-up to help deal with the aggressive behaviour (casting it off). For the twin who is fine but affected by his brothers' behaviour, consider providing him with a supportive hand (enrolling him in the Big Brothers program or finding a youth councellor he can talk to) so that he isn't brought down by the situation. On the magickal level getting him a powerful good luck charm and toby, something like a jack ball, can help him feel special and cherished throughout it all. A peaceful home honey jar with all of you in it which includes blood root, borage and blue cohosh amongst the ingredients is also a great way to work for everyone and lighting blue candles on it could become a familial event. I was going to do a honey jar just for him but a family one sounds better. I will get every thing in order for 13 herb bath and the cast off evil. He's goes to regular check ups and been getting service the best they diagnose him with is emotional disturbance. He been getting counseling speech therapy which he's better now but there is more going on like I said I know it have something to do with my kids father side of the family and I want to break it from my son. His attitude is getting worst as he gets older. And of he is getting bigger and stronger and I wouldn't be able to control for long that what I'm seeing. I'm very intuitive and I see thing getting worst. I will definitely by a charm for my other son. I already know how to do honey jars I love them. But I will research into it more with the 13 herbs bath. If you haven't recently, please have his hearing checked. My best friends little boy was getting in all kinds of trouble and acting out at school and home. The teachers were cruel to him and tried to move him to different classes. The school demanded that he be put on strong drugs for ADD. It was around then that I was talking to him and watching his reaction and realized he was trying to hear me but couldn't. He had had a silent ear infection with no pain that we had thought was a cold and it resulted in severe hearing loss. It had progressed over time so he didn't realize it and it became normal to him to hear that way but he was frustrated because he couldn't hear the teachers or classmates or us so that affected his behavior. Once we got him on an antibiotic and a hearing aid, he turned back into the amazing and well behaved child we'd always known. Please ask your doctor about these issues. It breaks my heart knowing that good kids get mislabeled because of illness. Especially since I remember how frustrated I'd get at my best friends son and how guilty I felt when I realized he didn't listen because he couldn't hear me. I agree they diagnose the kids these days with anything. His school try to say he is autistic and its clear he's not then they try to say he was unteachable but yet he was getting 100s on spelling and math test and he's is a very smart kid. He just have a very bad attitude when things don't go his way and have a controlling behavior now he starting remind me of his father and it's not a good thing. I left their father cause he try to kill me so I want handle this behavior now. I would do anything for my son. Has he been checked for Aspergers Syndrome? My daughter used to be friends with a child whose behavior sounds similar, he also excelled at Spelling and Maths. He was very manipulative and also used to have tantrums. Just an idea. Romani52 thanks for the information. I just googled it and it does say it's genetic and it can come from the father side of the family which is what I been saying. The thing is my sons is very athletic like to play and run around I can see him being an athlete and is very social, and he sleeps well lol. But his communication is bad but he do understands what you tell him. I will still look into it more. Will definitely ask his doctors about it hopefully get him tested to see if he has it or not. I been going back and forth since he was a toddler and no one seems to really know what is cause. Hopefully he will grow out of it. His speech is way better than it was when he first started to get help but his behavior is just too much for me. Just now he came to me and apologize to acting up (he wants to watch tv and play videos). He knows what he's doing but I know tomorrow there will be a problem again. I tried meds on him before they gave him adderall and that made him like a super villain. I just don't know what to do anymore. Hopefully a lot of prayer, spiritual spells, mediation, cleansing, and my honey jar can help with this situation, along with the help he gets from the outside. I'm taking it now as a spiritual fight. Cause he a great kid but his bad behavior comes out of nowhere recently. You're a good mom! It shows! My sons father sounds a lot like your sons father. I'm so happy that you could get away from him! I'm still trying. Best of luck to you! Thank you so much SeleneAnna. I think it hard for any of us to break away from a relationship especially when it's someone we truly cared and loved unconditionally at a point in our life. I took me some time but I'm glad he's gone completely out of our life. I totally found away to lose contact with him and the funny thing is he still knows where I live. I learned not to put any type off energy into him anymore. I think we all especially that we do a lot of spiritual work whether it's prayer, hoodoo, spells, etc; us thinking about them whether good or bad we still connect to them on a spiritual level. Try not to focus on him as much. I hope the best for you to hun. We all deserve the best in life. I'm looking for a way to help my son who is 8 years old. He is possibly on the high functioning end of Aspergers. One of his main problems is he has rage/anger problems and has since he was a baby. He gets irritated easily and gets very upset if things don't go his way. He has finally verbally told me he feels very angry. I don't think he knows why he feels this way or how to help himself. Can some one give me some direction on ways I might help him feel calmer inside? My first thought was maybe an amulet or charm he could wear, something he could have with him all the time. Last edited by catherineyronwode on Wed Nov 07, 2012 9:53 am, edited 2 times in total. My son is Autisic but is high functioning. He was always an easy child to deal with until he hit puberty and then all he'll broke loose. He takes respertol at night, otherwise he won't sleep, and I mean that literally. That and regular exercise seems to help. Wear that kid out. But I am going to try the above mentioned peaceful home honey jar as well. Very excited. Thank you Archangel Michael for all your protection! I totally agree with Ms Cat and Ms Tammie suggestion. I also am the parent of an 8 year old moderately functioning autistic son. I would recommend ordering the Crown of Success Spell Kit. I would place my intentions for focusing in school, dealing with community, when he is in respite care, anger management. I would also add inside the mojo bag that comes with that Deer's Tongue leaves (this will help with speech and communication). I would also do a paper name petition write your wish for on the paper (e.g. "behave now, focus, calm down") , then turn the paper 90 degrees and cross and cover wish with your name, 9 times. Circling petition with phrases like "stop being aggressive, follow my directions, calm down, be content, be safe," etc. Dress the paper with Crown of Success Oil and King of Solomon at the four corners and fold it toward you to draw the wish in. Place it under sole of shoe and bless it by saying, "May my work be crowned with success and may (name of son) be less aggressive and more cooperative." I would put the mojo bag in the bookbag pocket where he would not find it; or the bag he would take to be with respite worker, or inside jacket pocket. Also I would purchase a Holy Card of Dr Jose Gregorio Hernandez and dress with protection sachet. Dr Jose Gregorio Hernandez is patron saint of medical students and doctors and he helps them with diagnosis and treatment plans. Pray that the doctors would be able to handle his aggression and address his behavioral/educational needs. Also pray that they try to educate themselves on autism spectrum disorder. The protection dressed on it so that no one takes advantage of your child's vulnerability for abuse of any kind. I would put this in his pants back pocket. I know first hand it's a journey; and there's no cure but there is HOPE in every progression that is made. Thank Godness found this forum about the spiritual aspects of Autism. My son was diagnosed with severe Autism, he is 7 years old. He is very super hyperactived. Hopefully with the informations here, it can help for my son expecially i'm a single mom right now. I know it is difficult to take care of them. My toddler is having problems at daycare with aggression. He acts out very badly, hitting and throwing objects at others. This is not his behavior at home. We are trying our best to teach him it's wrong to be aggressive but i sense that he gets frustrated because he cannot talk yet. I also suspect other children gang up on him because they know he gets into trouble and it's easy to blame him. The daycare is threatening to expell him and we cannot afford anywhere else if they do. He's been going there since birth, he's two now. I have been bathing him with King Solomon, Cast off evil, & St Michael. I also wanted to start a honey Jar to place him and the other children and staff in. What products and herbs do you recommend? I think a honey jar is a good idea, but if parents are allowed to bring treats to the daycare center, such as cookies, a sugar jar is an even better idea, because you can use the sugar to cook with. Dress your candle with a blend of Tranquility, Spirit Guide, Clarity, and King Solomon Wisdom Oil. If you wish to add an herb packet to the sugar, use only edible herbs that bring peace and happiness, and keep them light, not overpowering. You can find a list of such herbs in the indexes in the back of "Hoodoo Herb and Root Magic," and check their edibility via the internet or your own knowledge base. You can then use the sugar to bake cookies and bring them to the day care center. 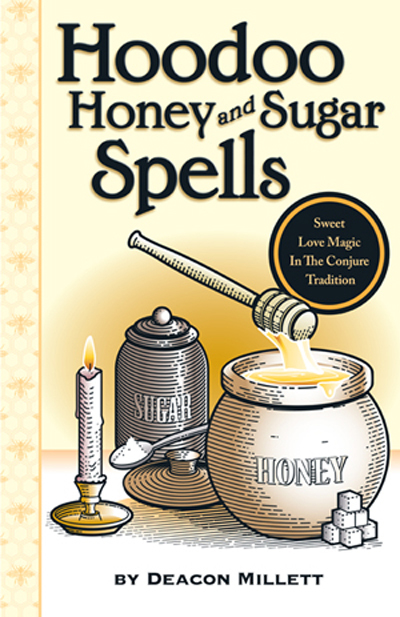 Read more about how to use sugar and honey jars in the book "Hoodoo Honey and Sugar Spells" by Deacon Millett. I would also like to note that something else in your query concerned me greatly. You say your child is two and "he cannot talk yet." A child who is not talking by the age of two has developmental delays, deafness, or other deficits that are slowing down his understanding of social norms and interpersonal dynamics. If your son has not been tested for developmental delay or deafness, he should be, and you should avail yourself of the best help you can afford and that your state health system provides. A child who is aggressive or being bullied in daycare because he cannot talk by the age of 24 months should be a red flag to the daycare center, and they should be consulting with you about this, not threatening to "expel" him. Here are some milestones for the development of language. These are the averages, and they are well known and are used by pediatric specialists to test children. If your son is not meeting these milestones, he needs medical and psychological intervention to diagnose the cause of the trouble and to begin treatment. Yes thank you. I always take a gift basket this time of year so the sugar can fit right into the plan. Thank you for your concern with his speech delay. I am planning on making an appt with his pediatrician. A sugar jar is prepared like a honey Jar but can also be shaken correct? A sugar jar can be shaken, yes. It can also be praparesd in a regular suagr bowl for the table, in which case it would be stirred, not shaken. I am glad you are making an appointment to get a diagnosis on his speech delay. This is important. Deacon Millett has filled this book with spells and recipes for making and using your own sugar scrubs, sweet bowl spells, honey jars, and honey baths for family matters, romance, job-getting, health, and happiness -- all available in one easy-to-read compendium. This isn't a developmental issue but this seemed like the best thread for the question. My youngest has a speech impediment from bad speech habits. He has been tested in the past and there are no hearing problems or other issues. I would like to do something for him to help give him some confidence and support. I know deer's tongue is used for communication but I would like some suggestions on what else could be used. Thanks! You are a good parent! I love the way that you are approaching all angles of the situation. I'm sorry to hear that you are so worried about your child. One idea would be to dress a candle with Master oil and roll it in crushed up Deer's Tongue, and burn it on top of a petition paper that says something like, "May my child's tongue be loosened and may they be masterful in all aspects of speech and communication." The petition paper doesn't have to be complicated, just speak from the heart. Although many adults who were diagnosed as children with autism spectrum, Asperger's, delayed speech, or developmental delays are comfortable with their diagnosis as adults, it is still the case that when they were young, family members, especially mothers, found it valuable to seek help for remediation of these conditions. Getting good therapeutic assistance and intervention at a young age is imperative, and there are spells and prayers that are also of aid. For starters, I would like to recommend Deer's Tongue Herb, a plant that is reputed to give eloquence of speech. Next, for Catholics such as myself, Saint Joseph of Cupertino and the Franciscan Brother Juniper (a companion of Saint Francis of Assisi) are thought to have been on the spectrum, and they may be petitioned for understanding on the path to adulthood. Spiritual supplies that have been used for these conditions include Clarity, King Solomon Wisdom, and Blessing. My 3 year old child just got a diagnosis of a mild form of autism, mainly and specifically on late speech and language development. I feel quite broken inside atm, just cried my eyeballs out because who would want that for your child right...You just want them to be healthy, grow up well and be as happy as they can be...And yes, we're in the process of getting professional help. But I need help on this level too...Anything and everything! Please help me, what can I do for my child? That is difficult news to handle, and my heart is with you. I am glad to hear that you are seeking therapeutic intervention. It really does make a difference. Being a parent myself my heart goes out to you. Rev Earnest has given you excellent advice. Miss. Cat wrote an excellent book called Paper in my shoe. This book explains in detail how to write a petition. Here’s the link. I am sorry to hear about your child. I am a teacher by trade and work with many students with disabilities. I have a student with autism right now who is very high functioning, in the honors program and very smart. I found myself constantly telling other teachers he was autistic as a protective measure and I realized the student does not have a problem, I do, I was subconciously judging or predisposing him because of my "understanding" of the condition not the reality of who this child is and what he can actually do. That was a big eye opener for me to step back and appreciate. As for work, you certainly can make a mojo and stick it under a bed, between the box spring or pin it behind the headboard. You can make baths with the herbs mentioned by Rev Earnest, order bath crystals of blessing, King Solomon and Clarity mix them together and bath your child in it weekly. Add the oil to a body wash or shampoo, even a tiny drop in a body lotion. You can pray Psalms 96 for blessing a family bring peace and joy, and 97 (red with 96) for healing and blessing oil. Also its very classic to recite Psalms 23 followed by a petition. A petition is simply the prayer request that you want answered. Cat has a great book, as listed by Thomas K that goes into petitions and many ways to write them, fold them and use them. Your petition would be related to the desire of the work and the herbs and items used in the work. Example of a petition: With the grace of God may (Name of child) be blessed with great doctors and teachers, may he/she have perfect health and develop mentally and emotionally and learn to speak properly using new words and completing sentences, May Gods blessing be with her always and forever amen. Another example: May (child's name), develop properly as a child, speak completely and clearly amen. Another example: May (child's name), Strive and thrive in her learning, comprehension, speech, use of language and development Amen. Just some quick ideas that I can think of off the top. I hope this helps! I just wanted to add to what the moderators have said, because I know what these types of struggles are like from your daughter's perspective. First off, I'm a nuclear physicist and I'm currently working on my third degree in nuclear engineering, so I can work on the more applied side of nuclear physics. I put this out there because there are 24 people in my graduating class this year and about half of them have been diagnosed with autism. There's something about autism that allows the brain to figure out some of the most obscure things, that an average brain can't find. It's hard to explain and I'm not a doctor, but they definitely pull the class forward a lot of the time, by figuring things out that no one else could, and by seeing things from a different angle. As long as they have support and the proper medical care, my personal opinion is that these guys are more successful with autism than without it. There are obviously some struggles that they have to deal with that others don't, but those things are also seeming to get better with time, as people understand autism more and especially since they're surrounded by others with autism. My personal struggle isn't with autism, but with another learning disability that I wasn't diagnosed with until I was in my late 20's. I have a severe case of it but the doctors never picked up on it since I was always quiet and girls react differently to it than boys. So before there was more information about it, everyone just thought I didn't care and/or that I was dumb. On top of that, I have brain damage from a brain injury that occurred on a combat deployment a few years ago that requires me to take medicine throughout the day in order to have the use of the cognitive functions of my brain. And yet, I'm still over here plugging along lol. I had to continue what I was doing before the injury out of necessity because I don't have a spouse or parents or anyone else in my life who could support me or help me at all. So I just kept going. But your daughter has a lot of things that I didn't and still don't have. For one, she has you. I didn't have parents, I was a ward of the state as a child and I can't stress to you how much it messed up my life to not have an advocate to speak for me and to help me figure out what tools I need to get by in my unique situation. She was also diagnosed very young and at a time when doctors are eager to learn more about autism and things are getting better every day. All in all, she has a lot of things going for her and it's unlikely that that will change. It's something that will probably just keep getting better with time. She's unique and has a different set of obstacles, but what comes with that is a different set of skills and opportunities. I don't have any root work advice to give but sometimes with mental things, both for your daughter and for the mental fatigue that this might cause you, you can move mountains by just continuing to keep going. Not fast or with power.. But just with breath in your lungs and a heartbeat lol. Sometimes it's all you can do. Maybe it's just an issue of timing, before things ease up. But either way, your daughter is very lucky to have a mother who cares so much about her. That's all that really makes a difference in the end, anyway. It was a great idea to use bath crystals since we do have a bathtub and she loves to bathe in it...I'll be ordering it this week thank you! I will also add oils to the shampoo and bath wash like you mentioned. Thank you so much for the psalms and examples of petitions...I appreciate it tremendously...Bless you! First of all, I am so sorry that you had to face your situation and struggles all alone...It really breaks my heart to hear that...But you should be very proud of yourself because you've turned into such an intelligent and beautiful individual. Your words gave me great comfort and support. I can't even describe how much it meant for me to hear that. I feel as if I can move mountains and surpass all hardships now. For my little one, I would go through hell and back. Her amazing father would also do anything for her. Thank you so much ScorpioKate. I will be able to sleep better tonight...I hope all is well with you. May all your dreams come true and may you always be protected wherever you go. Bless you! I think it would be good for you also to bath in clarity bath to help you see clearly through this situation and King Solomon bath to make wise decisions and the right decisions for your daughter. Wearing the oils as well and using them on a white figure candle for you and your husband to burn to be followed by the Holy Spirit to do whats best for your daughter. Future fears for your daughter is a fear we all have. I can say as a teacher I have never seen the Autistic kids in my building teased, but each school is different. I actually have found that the kids read mean things on the internet that people say and jokes they make. That is actually the issue im currently working with for one of my autistic students who tells me people make mean jokes or post things on the internet. a mojo to protect her would be a great item to put in a backpack to keep her safe, Angelic root is a great herb for that. ScorpioKate, thank you for sharing your experience in school with Autistic students in the program I actually shared that with my student as an example and not to read or listen to things that are negative about him or to him. He seemed to respond very well to the message. Ok so here’s the issue, I have a cousin who is a great mom to a autistic boy. Her son is a great kid and I see that he’s smart but he’s not compliant enough to show what he knows and now she says he’s having trouble in school due to his behaviors. I babysit for them from time to time and from what I see he’s not disrespectful but very playful to the point that he doesn’t listen. He non verbal but I’ve heard him talk a few times so I see that he can and he’s also a stubborn child meaning if he doesn’t want to do something he will not even if it’s for his own good. I’ve spoke to her and she’s knows I practice hoodoo and she’s willing to let me help but she was clear about a few things. She still wants him to be able to be playful because he’s a kids but she wants him to follow directions, listen and show his teachers and her how smart he really is. His behaviors are putting him in danger because he gets so excited he doesn’t pay attention to his surroundings. He doesn’t listen or follow directions, and I think he maybe a bit shy but I’m not to sure. A white skull candle with deers tongue for his speech but I’m not sure on what to use for him to listen more and focus. Please note, she has him in a lot of therapy’s already so at this point I think she just needs a spiritual boost for things. A couple more additions that I would recommend making are Clarity and Tranquility products. The Clarity products will help clear his mind and help him focus, and the Tranquility will help calm the anxiety that can often come with autism (I'm autistic myself and it has helped me). I also think a skull candle with deer's tongue is a great idea, and I think that would be fine to make a mojo that the mother feeds. Some mojos have been known to be touched and even shared with a daughter, such as a nation sack. Also that you are working this for a child, I would see this as similar to working a blessing mojo for a new born, in which case yes it would be ok for you to work it, pray it and put it on the child. To me its really your mojo that you are putting on her to assist her. When she is of age and able to understand then include her in the process and importance of hiding it. Also the mojo can be placed under her bed, in a box spring, or pinned behind a head board. St. Jude is great for difficult and impossible things. School lottos can be very hard, as hard as playing the real lotto. A honey jar to sweeten the admission to your son to accept him and a crown of success for him to be successful in being accepted to the school. You can also dust the application over with look me over sachet powder to get noticed.